by the Bujinkan Dojos of Soke Masaaki Hatsumi. Budo Taijutsu is a practical natural real fighting and philosophical martial arts system deeply founded in the lore of the mystic warriors of feudal Japan, both the Samurai and the Ninja. In our dojos we practice techniques, wazas, principles and philosophies of 9 different Japanese martial art schools, known as Ryu in Japanese. We train both unarmed and armed (both ancient, exotic and modern). We train in true proven ancient budo methods and we train in modern applications that have been used by Special Forces, FBI, DEA and police forces worldwide. The founder and International Director of the Bujinkan Dojo (Divine Warrior Training Hall) with its Hombu Dojo, called the Bujinden (Divine Palace), residing in Noda City, Japan is Grandmaster Masaaki Hatsumi (commonly referred to as Soke – head of family). Soke Hatsumi is the inheritor of nine Samurai/Ninjutsu traditions from the late O’Sensei Toshitsugu Takamatsu (perhaps the last true living Ninja) in 1972. Even at 80 years old he still continues to share his budo several times a week to instructors that come from around the world. Bujinkan Shihan Richard Van Donk was one of the first foreign students of Soke Hatsumi to ever pass the 5th dan test in Japan becoming a full licensed teacher of the arts, a Shidoshi. That was in early 1986. Since then Shihan Richard Van Donk has done his best, at great personal expense, to provide the opportunity to study this great art to the general public by creating a entire university of study materials to take you from beginner to master level. Shihan worked hard to get Soke Hatsumi to put his works on dvd with English subtitles and to translate all of Soke’s books into English so that students can appreciate them. You will find all the teachings you may want on this Ninjutsu/BudoTaijutsu art at Bushindo Universities Store http://store.ninjutsu.com/. At IBDA (International Bujinkan Dojo Association) we directly practice Budo Taijutsu studying the art school by school formally starting with Gyokko Ryu at 2nd degree BlackBelt. Let me clarify that for you. Shihan Richard Van Donk first learning Ninjutsu / Ninpo taijutsu before Soke Hatsumi switched his teachings to Budo Taijutsu in the 1990’s. Shihan Richard received his 9th dan in Ninpo Taijutsu (highest rank possible in that art) before beginning his Budo Taijutsu training. Ninjutsu/Ninpo Taijutsu is why he started in the arts. So he teaches Ninjutsu / Ninpo Taijutsu first to all his students. Most students that join us really want Ninjutsu. So you earn your Shodan in that before starting formal Budo Taijutsu with IBDA. These fundamentals are imperative in our opinion or your Budo Taijutsu will be very weak in a realistic combat situation. Our beginning IBDA students start their Bujinkan Arts Ninjutsu/Ninpo Taijutsu journey at 9th kyu tori gate learning a complete detailed overview all the fundamental basics of the Bujinkan schools while directly learning Ninjutsu, art of the Ninja for their 1st degree BlackBelt. The IBDA Ninja BlackBelt level study includes Body Conditioning, punching, kicking, grappling, countering attacks, Art of winning, awareness training, Stealth, Gotonpo (use of the outdoor elements), Meiso (Meditation), Metsubishi (blinding powders), Dream work, Exotic Weapon Training, Philosophy and much more. 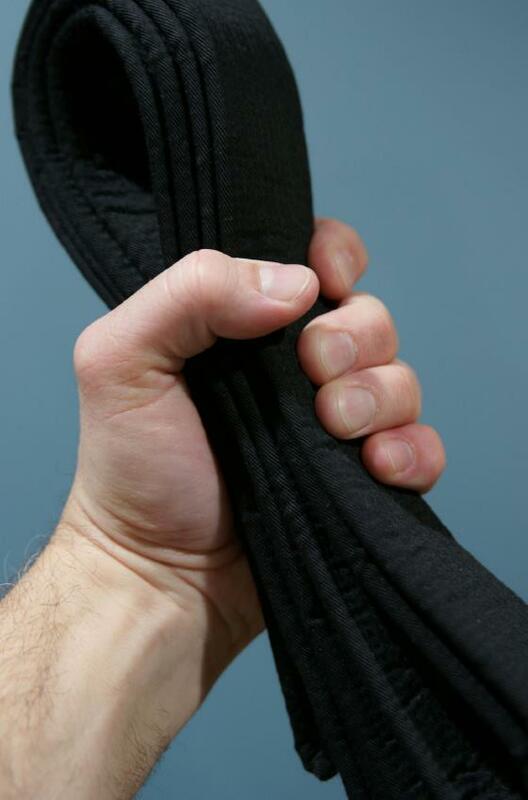 Hundreds of techniques and principles are learned in the Shodan Ninjutsu BlackBelt Course, which was designed to work as a study both in or out of the dojo. Then at IBDA we directly practice Budo Taijutsu studying the art school by school formally starting with Gyokko Ryu at 2nd degree BlackBelt, Shinden Fudo Ryu at 3rd Degree BlackBelt, of which we have complete waza training courses. Of course you study all the pieces of Budo Taijutsu while learning Ninjutsu from us. In our Budo Taijutsu Course you will learn the master principles of the art so you can apply things like: staying safe by positioning, posture power, footwork, taijutsu integration, art of distancing, timing, angling, control without grabbing, determining space, any technique with any weapon, finger locks, striking kyusho points, unattached commitment, mastering the kukan, running energy, etc..
What is not to love about the mystical teachings of the Ninja? We love Ninjutsu and all that it stands for. That is why we teach it as the foundation to ALL Bujinkan teachings. This includes teaching it as a foundation to the Budo Taijutsu that is now taught in the Japan hombu dojo. You will NOT learn Ninjutsu in the Hombu dojo. This art has not been taught in Japan for at least 15-20 years. But you can get it here from some that personally learned from Soke Hatsumi, as a personal student. Shihan Richard Van Donk first learning Ninjutsu / Ninpo taijutsu before Soke Hatsumi switched his teachings to Budo Taijutsu in the 1990’s. Shihan Richard received his 9th dan in Ninpo Taijutsu (highest rank possible in that art) before beginning his Budo Taijutsu training. Ninjutsu/Ninpo Taijutsu (and sword) is why he started training in the these arts with Soke Hatsumi. So he teaches Ninjutsu / Ninpo Taijutsu first to all his students. He always will. Most students that join us really want Ninjutsu and not Budo Taijutsu anyway. So you earn your Shodan in Ninjutsu before starting your formal Budo Taijutsu with IBDA. These fundamentals are imperative in our opinion or your Budo Taijutsu will be very weak in a realistic combat situation. Foundations are everything from a marriage, to a checkbook to the house you are living in. Learn the foundation first. Learn the form first and then play with the shadows. 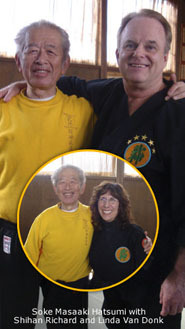 Since the very early 1980’s Shihan Richard Van Donk and his wife Linda have pioneered Grandmaster Masaaki Hatsumi’s Ninjutsu (and Budo Taijutsu) around the world with their proven study programs and International dojo affiliations. Richard, a personal student of Grandmaster Hatsumi, was one of the first Bujinkan non-Japanese students to become a Shidoshi, a fully licensed teacher of the warrior ways of enlightenment in 1987 when he passed his 5th degree test. He was awarded 10th dan in 1995 and his Ju-Godan (5th level of Judan) on Dec 2nd, 2004 (Soke Hatsumi’s Birthday). Today as director of the International Bujinkan Dojo Association, known as IBDA, he is still working on more study materials for his students around the world, doing seminars, hosting annual Tai Kai events and taking students to train in Japan. We invite you to explore the Bujinkan teachings offered by IBDA and to train with us either at an IBDA Bujinkan Dojo near you or hook up with a certified IBDA instructor for private lessons with Skype, or by studying with a buddy in our proven Home Study Courses, if there is no dojo near you.